So, this one. Oh man, watching Day of Honor I think I said, "Oh it's this one!" about three times. This is the one where B'Elanna almost goes through with the pain sticks and the blood pudding that the Klingon Day of Honor entails. 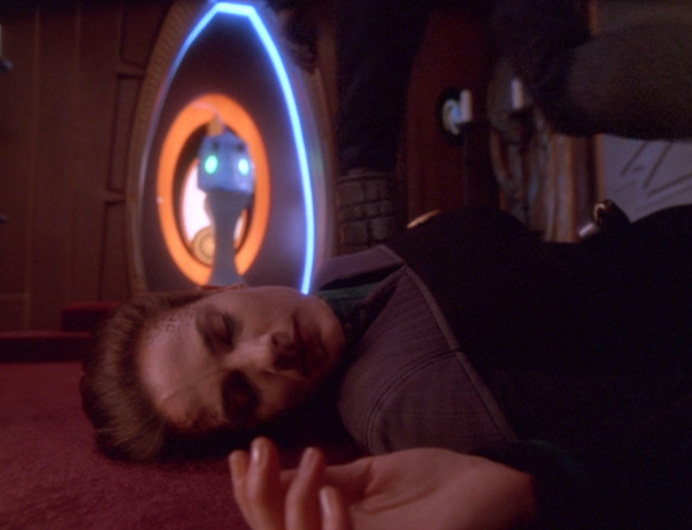 This is the one where B'Elanna's having a terrible no good very bad day. 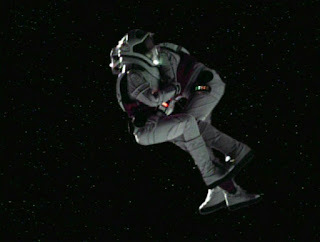 This is the one where B'Elanna and Tom get stuck in spacesuits and B'Elanna's all, "I love you." And Tom's like, "Cool. Let's hug and pass out." This is the one where I just want to robotically mash my hand onto B'Elanna's shoulder (because I'm Seven) and say, "Girl, we've all been there." "Do you need... a pedicure? I don't know. Is that something women do? It seems like that's a thing." B'Elanna's character arc is one of my all-time favorites in Trek. It's interesting to think about the cocky, sorta violent, Maquis chick who argued with everyone and everything all the time in the first season and compare her to Third Season B'Elanna. She's the same woman. Just more grown up, more experienced, more open to possibilities. In this episode she actually tells Neelix, "Maybe being so far away from anything Klingon has changed me." And I think that's pretty interesting. She's spent a lifetime running from who she is but the more she embraces her weird, aggressive, Klingon side, the more well-rounded and peaceful she is. Her evolution is lovely and believable. This episode was actually called, "Tears of the Prophets." Not a happy ending. -I love Seven's sudden burst of humanity here. Her transition into crew member is believable and, for her and me and everyone else, kind of intense. -Seeing a species ravaged by the Borg is compelling and it makes sense for Voyager to run into them, offer them help and even be taken advantage of by them. To witness their desperation and ultimate humanity is so Trek. I love it. -Side note: Roxann Dawson was secretly about three months pregnant in this one and, while I wouldn't have any idea what that's like for many, many, many reasons, it seems like shooting in a spacesuit while bobbing up and down on a blue screen teeter-totter contraption must've made for an actual awful day. Whose Couch Is This? The Sequel.